Scholarship recipients pose for a photo with Major General Irene Trowell-Harris, far left, and Glendon Fraser, far right, during the 21st Annual Tuition Assistance Awards Celebration of the Major General Irene Trowell-Harris Chapter of the Tuskegee Airmen 1on Saturday, February 2, 2019 at Anthony's Pier 9 in New Windsor, NY. Hudson Valley Press/CHUCK STEWART, JR.
NEW WINDSOR – Glendon Fraser, President of the Major General Irene Trowell-Harris Chapter of the Tuskegee Airmen, held back tears as he pointed to the center of the ballroom floor on Saturday night. It was there that chairs would usually be placed for the original Tuskegee Airmen who would be recognized during the annual Tuition Assistance Awards celebration. But sadly there are no more. For the past 21 years, Fraser has been able to call out the names of several Tuskegee Airmen. Names like William Johnson, Wilfred DeFour, Dabney Montgomery and “Coach” Roscoe Draper. He has watched as they have aged, and their numbers decline, leaving fewer and fewer of those precious chairs for men of great character to fill. 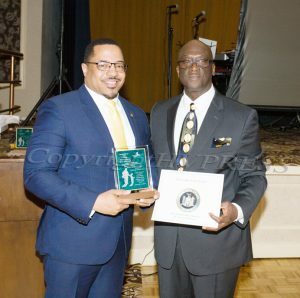 Torrance Harvey receives the Trowell-Harris Award from Glendon Fraser during the 21st Annual Tuition Assistance Awards Celebration of the Major General Irene Trowell-Harris Chapter of the Tuskegee Airmen on Saturday, February 2, 2019 at Anthony’s Pier 9 in New Windsor, NY. Hudson Valley Press/CHUCK STEWART, JR.
Over the years it seemed to provide Fraser, and all those associated with the local chapter, with a drive, a sense of urgency to not only establish a viable chapter of the Tuskegee Airmen, but to continue to build the bridge that the Tuskegee Airmen paved and assuring a path to the future that the chapter namesake Dr. Irene Trowell-Harris has kept them focused on. Thus this year’s theme, “Building Bridges: A Path to the Future.” Saturday night the group honored the legacy of the Tuskegee Airmen by presenting 12 scholarships to college-bound high school seniors from the Hudson Valley. This year’s recipients were: Melanie Angel; Kelly Bramble; Mark Carter, Jr.; Michael Castro; Brandon Gibbs; Joshua Keller; Evan Hathaway; Conner Leggett; Marvin Mungo; Michael Shorter-James; Kerry O’Connell and Nina Zylberberg. 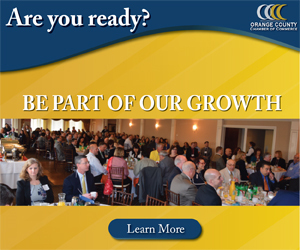 That brings the total amount of scholarships awarded to over $217,000. They have also created the Hudson Valley Tuskegee Airmen Endowment Fund which currently stands at $270,000; operate the one of a kind Lee Archer Red Tail Youth Flying Program at Stewart Airport; provide more than 100 hours of flight time to students in the Red Tail Flying Program annually; and provide hundreds of hours of mentorship to their program students. 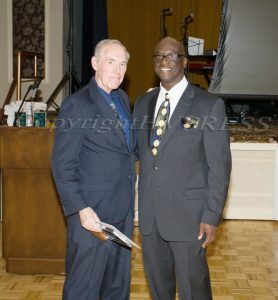 Everett Smith received the Trowell-Harris Award from Glendon Fraser during the 21st Annual Tuition Assistance Awards Celebration of the Major General Irene Trowell-Harris Chapter of the Tuskegee Airmen on Saturday, February 2, 2019 at Anthony’s Pier 9 in New Windsor, NY. Hudson Valley Press/CHUCK STEWART, JR.
Marvin Mungo has been a recipient of that mentoring via the Red Tails Program for the past four years. “I have been able to gain an understanding and appreciation for the field of aviation,” said Mungo, a senior at Middletown High School. Mungo aims to become a lawyer, and as a result of his involvement with the Trowell-Harris Chapter’s Red Tail Youth Flying Program has decided that his specialty will be aviation law. 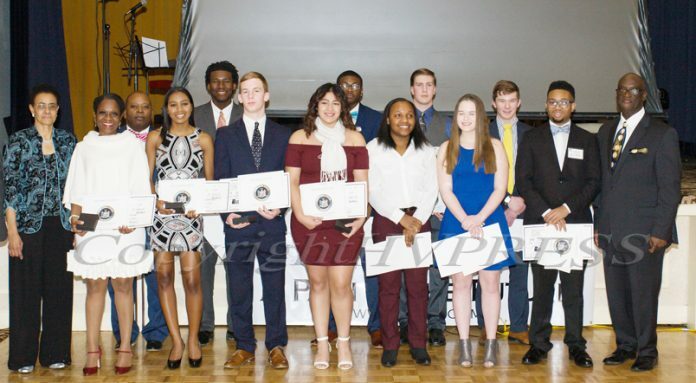 In addition to the 12 scholarships awarded, the group also honored Everett Smith, City of Newburgh Mayor Torrance Harvey and the Newburgh Armory Unity Center. 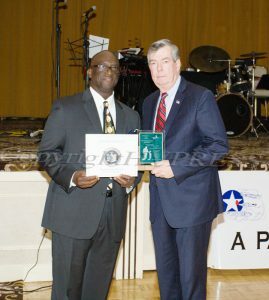 Glendon Fraser awards the Newburgh Armory Unity Center (James O’Donnell) with the Trowell-Harris Award during the 21st Annual Tuition Assistance Awards Celebration of the Major General Irene Trowell-Harris Chapter of the Tuskegee Airmen on Saturday, February 2, 2019 at Anthony’s Pier 9 in New Windsor, NY. Hudson Valley Press/CHUCK STEWART, JR.